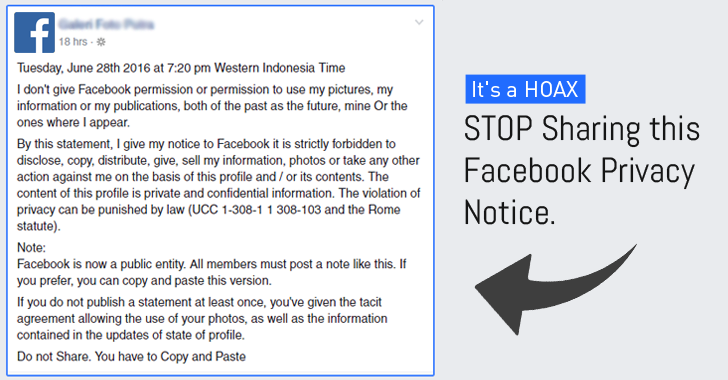 Recently, you may have seen some of your Facebook friends started posting a Facebook "Privacy Notice" clarifying that they no longer give Facebook permission to use their photos, personal information, and so on. "From Monday, 27th June, 2016, 1528 IST, I don’t give Facebook permission to use my pictures, my information or my publications, both of the past and the future, mine or those where I show up. By this statement, I give my notice to Facebook it is strictly forbidden to disclose, copy, distribute, give, sell my information, photos or take any other action against me on the basis of this profile and/or its contents. The content of this profile is private and confidential information. The violation of privacy can be punished by law (UCC 1-308-1 1 308-103 and the Rome statute). Note: Facebook is now a public entity. All members must post a note like this. If you prefer, you can copy and paste this version. If you do not publish a statement at least once, you have given the tacit agreement allowing the use of your photos, as well as the information contained in the updates of the state of the profile. Do not share. You have to copy." Last year in September, similar privacy notice was started circulating on the social media network, and they’re making the rounds again. But let me tell you, the Privacy update is just a Hoax. So, don’t fall for it. Facebook has made no such announcement; rather it has been made by people who are spreading this all over the social network. "You may have seen a post telling you to copy and paste a notice to retain control over things you share on Facebook. Don’t believe it. Our terms say clearly: You own all of the content and information you post on Facebook, and you can control how it’s shared through your privacy and application settings. That’s how it works, and this hasn’t changed." If you are really concerned about your privacy on Facebook, the social network provides settings that limit strangers, and of course the company itself, from accessing any posts, photos or content that has been shared by you. You can run a Privacy Check for your profile on Facebook that will allow you to limit the audience for posts and decide what information you want to share on your profile.